For those of you following the events around the falsely-maligned Stafford hospital and the government’s opportunistic decision to put Mid Staffs Trust into special administration – or for that matter, for any who care about the NHS and its treatment by this woeful coalition – the following information will be of vital interest. Please share widely. In February, immediately after the publication of the Francis report, the government took the opportunity to put Mid Staffs into special administration, with a view to breaking up or downgrading the hospital, while (they thought) few people would care about the hospital’s fate because of the dismal (and unfounded) picture being painted by the media’s version of the Francis report. The Health Secretary put together a team to make recommendations on the future of the hospital, then effectively installed the same group of people as ‘Trust Special Administrators’ (TSAs) to review their own recommendations on service downgrades and closures, and to decide whether to go ahead with them. But the incredible march of over 50,000 Stafford people and their resolute attempts to make the TSAs take their views into account have forced them to prolong the process. The TSAs asked in June to delay their recommendations by 40 days and these are now due next week, on 31 July. However, even though we’re officially still in the period for the development of draft recommendations and the public ‘consultation’ isn’t due to begin until after 31/7, it’s apparent that the future of Stafford hospital has already been developed – and not just in draft. we are now officially (emphasis mine) not going to reopen as a 24 hour department [and] we are not going to be funded to provide a 24 hour staffing model. Not ‘we might not reopen’. It’s ‘official’ – and changes are already being made to shift patterns and staffing levels because of the changes that are going to be made, changes that are clearly already known to the Trust’s management even though the public are being told that the decision is still pending. This makes a complete mockery of the ‘consultation’ of the public. As ever in this saga, the government and its representatives are telling the public one thing while ploughing ahead with what they’ve had in mind all along: the end, in any meaningful form, of acute hospital services in Stafford. As ever, this government is prepared to forget its claims to want to empower local people whenever what local people want clashes with its agenda. The ‘consultation’, the ‘independent’ review, the request for more time – all are part of the public pantomime, the going-through-the-motions in order to appear to be genuinely taking the needs and wishes of local people into account while a centralised, ideologically-driven decision is driven through that was made long ago in spite of the fact that the Trust was ahead of financial targets agreed with the Dept of Health and Monitor as recently as the beginning of last year. The people of Stafford are the victims in a drama that is a perfect reflection in microcosm of the government’s wider agenda, tactics and strategy for the dismantling of the NHS. 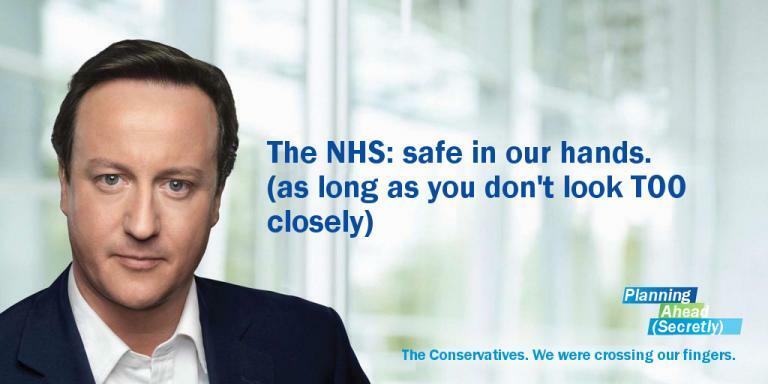 Their fight to save their hospital is our fight to save the NHS. If, as appears likely, the only recourse left to them is to look for judicial review of the decision – that’s clearly ‘official’ even though it’s not yet officially official – then they should have your wholehearted support morally, practically and financially, in that fight. You might live a couple of hundred miles from Stafford, but this government’s ambitions encompass your hospital, your services, too. Someone should alert Herr Burley about this, I’m sure he will fight it all the wa….hahahahaha oh I almost managed to type that without laughing. If you needed any more proof of this Fascist Governments contempt for the people of this nation, you only need to read this. This is just the tip of the tip of the amount of Corruption, Fraud, Lies, Deceit, Criminality, this cabal of Unelected, Treacherous, Scum have and still are committing. Once it’s all gone, when they’ve robbed our nation blind and left its people with nothing, we will never get it back no matter how hard we fight. Retweeted on http://smilingcarcass.wordpress.com/2013/07/22/stafford-hospital-future-consultation-next-week-but-downgrade-already-official/ and http://tamworthuk.wordpress.com/2013/07/22/stafford-hospital-future-consultation-next-week-but-downgrade-already-official/?preview=true&preview_id=208&preview_nonce=a2e91f6c02 and shared on social networking. Steve would you please reblog this, our Ambulance service is under attack here in Gloucestershire. And another report showing how the downgrading is deceitfully taking place. It’s not giving me an option to reblog for some reason. Will figure out a workaround shortly! Yet another example of the sham “democracy ” we have in the UK. Oh yes, people are allowed to ‘have their say’ – but that doesn’t mean this lot have any intention of taking any notice. 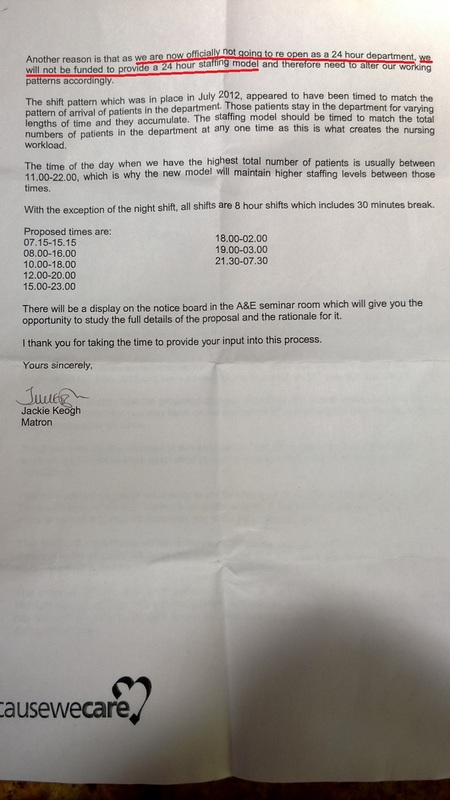 Getting a letter like that is chilling for staff. It reminds me of when the A&E department I worked at back in the early 1990’s was run down then shut down by Thatcher’s government. The people of the town launched a campaign to keep it open because closing it meant that they’d have to travel up to seven miles further for emergency care. We staff were kept in ignorance of what was going on for months about whether we’d keep our jobs. Later we discovered they knew for definite all along that it would shut but didn’t tell us until the last minute. History repeats itself. Its so sad.